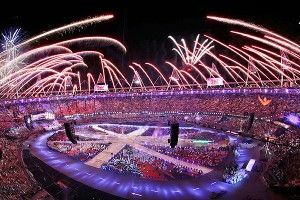 The London Olympics came to a close Sunday night and, as promised, the final ceremony was composed of an epic montage of British music acts representing their country. The 2012 committee trotted out a crazy-eclectic lineup, epitomized by the fact that boy band of the moment One Direction gave way to rock legends The Who and Queen, with Freddie Mercury represented via video screen. (John Lennon showed up prerecorded as well). Also on hand: George Michael, Russell Brand, Monty Python’s Eric Idle, Annie Lennox, Tinie Tempah, Fatboy Slim, Taio Cruz, Jessie J, Liam Gallagher, the reunified Spice Girls, and the mayor of London and Prime Minister of the U.K. awkwardly dancing to the reunified Spice Girls. Below is a quick YouTube highlight reel. Enjoy quickly! Here’s Mercury — not in Tupac-esque hologram form, thankfully — warming up the stage for Queen’s Brian May to do some light shredding alongside the bedazzled body-suited Jessie J. Since the Gallagher brothers are still mad at each other, Liam Gallagher’s new band Beady Eye came out to do “Wonderwall” without Noel. Soooo, why does Liam’s voice sound like that? Good question! I have no idea! Here are the Spice Girls, from one shrieking fan’s vantage point. And here is Prime Minister David Cameron and London mayor Boris Johnson getting the hell down to the Spice Girls. There’s no sound on the video, but they were probably shrieking pretty loud themselves. As for the actual Girl Power performance, the good people at Vimeo have it for now. And let us bring our YouTube highlight reel to a close, as is only right, with fireworks. Now, let’s do it all again in Rio in four years.